An award-winning Bangkok boutique hotel, Hotel Muse Bangkok is the home to some of the best restaurants in Bangkok. Nestled in the chic neighbourhood of Chidlom, Hotel Muse Bangkok tells a unique story through creative and inspired gastronomy. In other words, each of the dining outlets offers a carefully selected mix of local specialities, international favourites and creative cocktails. For instance, the list of best restaurants in Bangkok includes Medici Kitchen & Bar, Babette’s The Steakhouse and The Speakeasy Rooftop Bar. You are invited to embark a taste adventure and unveil these food stories one by one. Situated in the basement of Hotel Muse Bangkok, Medici Kitchen & Bar is an award-winning Italian restaurant serving up Inspirational Italian Cuisine. Named the best Italian restaurant in Bangkok for three years in a row by Thailand Tatler, the restaurant experience is one that inspires lifelong memories. Combining the freshest ingredients with modern culinary techniques, executive chef Bart Cywinski presents an innovative menu that is designed to awaken your interest. With an open-kitchen concept, Medici Kitchen & Bar also adds operatic elements to the dining experience. Above all, Medici Kitchen & Bar lets you savour novel flavour combinations while enjoying live music, performances and entertainment. Offering hearty handmade pasta and finely crafted creations, Medici Kitchen & Bar is easily one of the best restaurants in Bangkok. Babette’s The Steakhouse sets itself apart with a sleek, American-retro interior, immersing guests into the yesteryears. Wander into this Chicago-style steakhouse and you’ll be transported to the 1920s. Babette’s The Steakhouse is not only one of the best restaurants in Bangkok but also the top-rated steakhouse in Bangkok. In other words, you’ll find the finest cuts of imported meats and the freshest produce. While meat lovers can indulge in an exquisite cut of Tomahawk and juicy lamb chops, others can enjoy grilled seafood and roasted chicken. Aside from a creative menu and stylish setting, Babette’s The Steakhouse also offers an impressive collection of luscious wine. You are welcome to visit our walk-in cellar and search for dynamic vintages and rare bottles from the New and Old World. 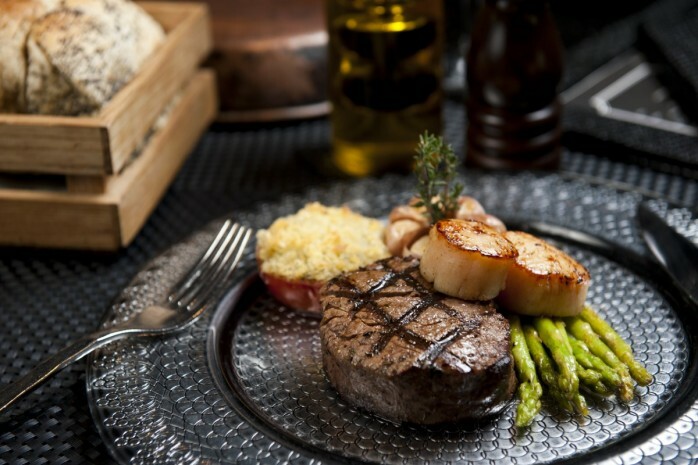 Pair succulent steaks and seafood sensations with a fine glass of vino. In addition, there is also a wide range of classic American cocktails for you to select from. Zoom up to the 24th and 25th floor of Hotel Muse Bangkok and discover our signature rooftop bar. The Speakeasy Rooftop Bar is a multi-level rooftop bar that has been named The World’s Best Bar in Asia by The Spirits Business in 2013. With an original menu of Thai-inspired international bites, The Speakeasy Rooftop Bar is also one of the best restaurants in Bangkok. The gorgeous rooftop venue offers comfortable lounge seating, fun tunes from a live DJ and breathtaking views of the Bangkok skyline. Inspired by the speakeasies during America’s prohibition era, the rooftop bar reimagines the finest drinks of yesterday for today’s sip. Above all, our expert mixologist Lersak Jamkadsin specialises in making classical and contemporary cocktails. For instance, if you let him know your drink preferences, he will be able to craft a cocktail catered to your tastes. Infused with stories and experiences, Hotel Muse Bangkok is the home of 3 best restaurants in Bangkok. Each of the three dining outlets captures the spirit of the cuisine and offers food that people crave. Our team of skilled chefs prepare authentic dishes using modern techniques, offering guests a sumptuous selection of delights. Join us for a unique dining experience today.